The California Highway Patrol uploaded a video on their Facebook page Sunday taken from their Donner Pass Vehicle Enforcement Facility. 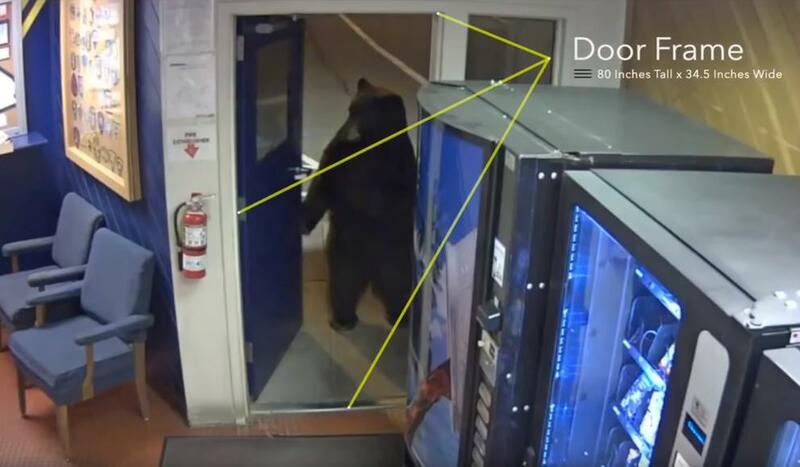 The video shows a massive brown bear stand up on two legs and open the facility's door. The big lumbering bear walks past a row of vending machines and past the camera's view. Eventually, the Smokey wanna-be decided there was nothing there worth his time and he meandered back out the way he came. Two armed officers follow the bear out the door, thankfully for them, the bear didn't seem too hungry for people. The CHP re-uploaded the video with enhanced graphics and it is sitting at a steady 30,000 views. The comments on the video are almost as entertaining as the video itself with users adding their own captions to the silent video. Mark Williams wrote, "Heard muttering "can never find a cop when you need one." as he walked out the door.". Jay Littleton said, "Vending machine prices these days, I'd exit empty handed too." Christina Terzian commented, "Sounds like the beginning of a great joke: "So, a bear walks into a police station…." Other comments weren't as witty with one user even questioning why the officer had his gun drawn. Another user said they thought it was a man in a bear suit when he stood up on his hind legs. Bears are all fun and games when they are on your screen, but when man and bear encroach on each other's territory they can be a fearsome enemy. Countries like India have native bear populations where the human population and the bears have collided. Some nasty videos of bear attacks have emerged from India. I'll let you do your own searching for those videos but for now here is a great eyewitness account of a man who was attacked not once but twice by a grizzly bear and lived to tell about it. The man's name is Todd Orr and he is from Bozeman, Montana. When Orr was first attacked, he took a selfie of his wounds after making it back to his truck which went viral. Orr's original video is included below after the interview. that guy who was attacked didn't grab his gun after the first attack and the second attack he had his bear-spray at the ready and not his gun.... that's pretty cool. he knew that this was just a mom protecting its cubs.